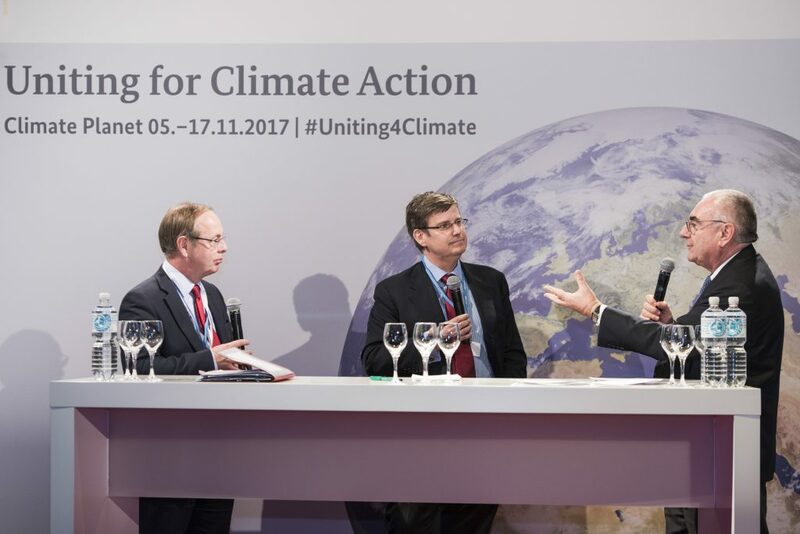 Bonn, Germany (November 17, 2017) – Ministers, Heads of State and Governments from around the world gathered in Bonn for COP23, providing an opportunity for Mission Innovation’s Steering Committee Chair, Patrick Child, to give an update on progress and look ahead to the future of Mission Innovation, two years from its launch in Paris. With the latest UN Environment Programme Emissions Gap Report showing that current pledges will only deliver a third of what is needed to stay in the safety zones of the Paris Agreement, clean energy innovation is essential to develop and scale up new solutions. Interviewed at the Sustainable Innovation Forum by broadcaster Nik Gowing, Patrick Child said “the momentum behind Mission Innovation is significant and growing. Two years in, we are translating this enthusiasm into concrete, meaningful collaborative actions with tangible results. I have great expectations for our seven Innovation Challenges and our outreach to the private sector“. Highlighting some Mission Innovation success stories, Child drew on the example of India. “By using Mission Innovation to bring increased focus to their innovation activities, India published a national Mission Innovation action plan and launched two international calls on Smart Grids and Off-Grids access to electricity. This is a very good start and a positive sign of the potential of Mission Innovation. In 2018, we expect that many Mission Innovation members will launch new collaborative funding opportunities“. Patrick Child (left), Mission Innovation Steering Committee Chair, discusses importance of public-private partnerships with Christoph Wolff (center), Managing Director of the European Climate Foundation, and Philippe Joubert (right), Executive Chairman of the World Energy Council’s Global Electricity Initiative, at the Start Up Energy Transition Launch at COP23 in Bonn, Germany. Public-private partnerships to unlock resources and finance was the focus of discussion at the Start Up Energy transition 2018 Launch, organised by the German Energy Agency (DENA). During a fireside chat with Christoph Wolff, Managing Director of the European Climate Foundation, Child referred to private sector initiatives such as the Breakthrough Energy Coalition, and highlighted that Mission Innovation provides compelling opportunities for forward-looking investors. The following day, at an EU Research and Innovation event, Clara de La Torre (European Commission’s Director for Transport R&I) and Hans-Joachim Schellnhuber (founding director of the Potsdam Institute for Climate Impact Research), engaged in a discussion with the Mission Innovation Steering Committee Chair on the importance of public funding for clean energy innovation and transport decarbonisation with attention drawn to the EU’s €3billion support to bolster Climate Action. COP23 was marked by calls for rapid progress on climate change, with the Fijian Presidency placing a special and touching emphasis on vulnerable countries, dramatically affected by climate change and made a global call for increased level of ambition in addressing the climate challenge. Child believes that initiatives such as Mission Innovation are crucial if the world is to fulfil the Paris Accord. Launched at COP21 in Paris in November 2015, Mission Innovation members committed to increase public funding for clean energy research and development, collectively representing over 80% of the world’s total. Recognizing the need to accelerate the development of clean energy solutions, Mission Innovation has established the foundation for global collaboration and provided a platform for the private sector to participate in cutting-edge clean energy innovation. This includes the announcement of seven Innovation Challenges at COP22. These challenges represent a global call to action aimed at accelerating research, development and demonstration (RD&D) in technology areas where Mission Innovation members believe increased international attention can have a significant impact in the shared fight against climate change. The Innovation Challenges are ambitious, spanning the entire innovation chain from early-stage research to demonstration projects.